NES Arkanoid (USA) "warpless" in 16:30.47 by Genisto. Arkanoid (1987) strongly resembles the arcade game Breakout (1976). 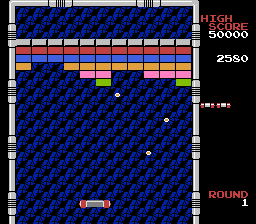 In Arkanoid, the paddle is actually a spaceship, and the bricks are space walls. The goal of the game is to break through the space walls and defeat the villainous Doh in order to escape from the space labyrinth. This incredible TAS of Arkanoid, made by Genisto, inspires awe in a manner comparable to adelikat's Gradius movie. No ball is ever lost, even though three balls are juggled in almost every level.